It's time to redefine your expectations of RIP software. Complicated color management workflows and tedious CMYK ICC profiling are no longer necessary to get high-end print quality and accurate color proofs. 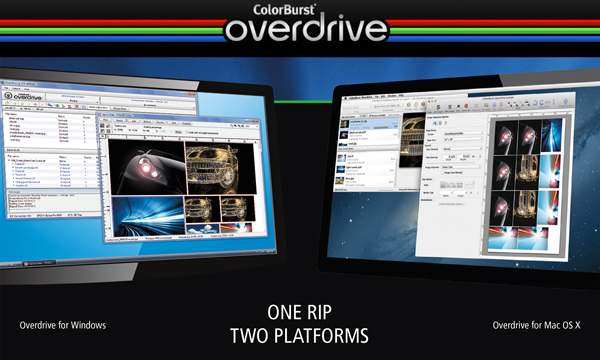 Overdrive 2 works its magic on top of your printer's driver and RGB media profiles to make accurate color both automatic and effortless. Overdrive is a PostScript RIP that uses new advances in color management and printing technology to deliver high-end color, accurate proofing and Pantone matching for any inkjet printer. Support for any paper is immediately available due to the universal nature of Overdrive's color management. Overdrive 2 has been completely rewritten as a 64-bit Cocoa application for Mac OS X 10.6 and later. Overdrive now takes full advantage of the multi-core processors in today's machines, so processing is significantly faster. A new visual interface lets you preview the selected file, and the Job List now contains scalable thumbnails. Proofing accuracy and text quality are improved with version 2. Overdrive Layout is included with every license of Overdrive. • Refit images in a layout based on "better fit" or "fewer cuts"
Mac OS X 10.6-10.11 is required. Mac OS X Server 10.6-10.11 is also supported. Mac OS X delivery: After your purchase, you will receive your receipt and two serial numbers by email to activate Overdrive and Overdrive Layout. Overdrive is available for download only (install CDs are not available). © 2019 Prepress Consultants. All Rights Reserved.